My dream finally came true. . . there I was, along with 15 other folklorists, aboard Royal Air Maroc, on our way to MOROCCO. We met at Kennedy Airport in New York. . . 15 strangers from all over the United States — Alaska to California — who would spend the next nine days as a family with the inimitable Morocco (“Rocky”) as our “Mama Duck”. Rocky was very explicit in her orientation letter & then in her extensive briefing in the airport prior to take off, which helped tremendously. The biggest item I had to master was changing Dollars into Dirhams. Wihout my traveling buddy, Shara (Sue Peel), I’m sure I’d still be standing in a souk with pad and paper in hand trying to figure out the exchange. Shara has a mind like a computer and all I had to do was look at her and she had the exchange figured out. We boarded Air Maroc at 6:40 pm our time, for the six 1/2 hour flight. Since there is a six hour difference in time between New York and Casablanca, I was naturally anticipating jet lag and made up my mind that I would get some sleep during the flight. When we were airborne the flight attendants handed out eye shades and maroon footies. Naturally, I questioned the footies and was told they would keep our feet from swelling during our long stay in a pressurized cabin. Our group looked great in the maroon footies, so great that we decided to choreograph a little routine which we called “Raks Sox”. Dinner was served, head phones distributed, and we relaxed for the evening. Rather than watch the movie, I put on my eye shades and snuggled down for a nap. Then it was up again for a continental breakfast of croissants, coffee, juice, sticky buns, and a bottle of Sidi Harazem. Sidi Harazem is the brand name of the mineral water that became a part of us during our stay in Morocco. Only if you’re a native do you dare to drink out of the tap in Morocco. Bathe in it, shower in it, wash your hair and undies in it, but don’t drink it! If you’re careful, you won’t need your Vibra-Tabs to ward off “Morocco’s Revenge.” No one on the tour had a problem. Finally we approached Casablanca. After de-planing, we had an hour’s wait before we boarded another plane to carry us to Tangier. The airport in Casablanca is very modern, and was very empty! None of the airport shops were open since it was so early in the morning (which disappointed me) so I found a seat, put my feet up on my carry-on luggage and napped. I’ll never forget the sight from the plane window during the one-hour flight from Casa to Tangier. Beautiful white, white buiildings, palm trees, the ocean . . . something right out of the Bible. The sight is so incredible, it’s literally impossible to explain. The “check in” through customs was a breeze (even though I don’t speak Arabic, French or Spanish), and I ran to the nearest exchange window to change my dollars into Dirhams. I wound up with a stack of bills about one and a half inches high, said shukran (the only word I know in Arabic) to the man behind the window, gave him a ball point pen and went to join “Mama Duck” and the rest of the brood. Rocky does a wonderful job keeping the brood together and counting heads. This lady takes care of everything! She had copies of our passports, collected money in New York for tips, had a list of everyone’s bunkies, and kept everyone under her very capable “wings”. While we were out having fun during the day, she was running her legs off to the clubs we would be going to in the evening, making sure that we had the best tables, that the clubs knew we were expected, that the food order was taken care of, that the tour buses arrived on time and took us where we were supposed to go, that we were treated royally, and generally saw to our comfort. She bargained with the cab drivers, the horse & carriage drivers, picked up all our train tickets, saw to our hotel reservations . . . I don’t know about anyone else, but I felt like a queen! As she promised, the Hotel Rif in Tangier was wonderful, right across the street from the ocean. The rooms were modern, clean and the beds comfortable. The bathrooms in each hotel during our stay in Morocco came equipped with a bidet which came in handy when we wanted to soak our feet and wash our clothes. After checking in, it was off with the “yucky” clothes, into the shower, a change of clothes and off to the nearest souk. Shara and I ventured out on our own and I must say, I was a little apprehensive walking into that first shop. I guess I must have seen the movie Casablanca one too many times, because I was expecting the worst. Here I am, Samira from Michigan, shopping in Morocco, trying not to look like I’m an American! I mean, don’t we all feel that no matter what, we’re going to get ripped off? Not so in Morocco! These natives love to bargain. In fact, the more you bargain, the more they like you. ‘Course the fact that Rocky explained this in orientation didn’t hurt either. I did find it very strange that all the shopkeepers have the name Ali, Abdullah or Mohammed. I can’t begin to tell you how inexpensive everything is there, and it’s all the good stuff. . . 100% cotton, cotton and silk blends, chiffons, silks, metallics. The leather in the bags is either goat or camel and the styles very unique. Wallets have designs stamped in 22k gold, and again, very inexpensive. You know those gorgeous brass trays that cost an arm and a leg in the U.S.? A pittance there. A couple of the gals on the tour brought back huge brass trays and pedestals, which aren’t that difficult to carry back. The shopkeepers do a great job packing them so you can easily carry them onto the plane. Silver is plentiful. In Marrakech, I had a lovely Berber cross hand-made for myself out of sterling which cost $12, including the chain. Rocky advised us to “save your shopping for Marrakech”. Not that Tangier was expensive, but we had to ship our luggage to the train station for our trip to Casablanca. I never realized how heavy 14 caftans were until I had to shlep the suitcase I filled with them. The price was right and who thinks about weight when you’re concerned with the wallet! Should have listened to Rocky, but I couldn’t leave those lovely Berber caftans in Tangier because I knew they’d be a great gift fot the girls in my troupe . . . so I shlepped. Next time I go to Morocco, I’m going to take one of those suitcase caddies with wheels. Ah, how we learn from our mistakes! While in Tangier, Rocky arranged for us to have our own four piece band and entertainment in one of the lovely side rooms in the hotel. Have you ever dreamt of dancing on an inlaid marble floor, in a room with handcarved arches, plush velvet settees, handcarved brass tables, brass lanterns, a warm ocean breeze coming in off of the veranda? Well gang, we had it all. . . I lived my dream! Rocky arranged for a male tray dancer to entertain us, and give us a lesson to boot! The food was luscious. . . tajine (a Moroccan stew), couscous, mint tea, and desserts that would knock your socks off! I never enjoyed fresh fruit like I did in Morocco. One evening we were served sliced oranges covered with cinnamon. . . a dream! Each morning our continental breakfast consisted of ‘sticky buns’, fresh butter, marmelade, and the most marvelous coffee I ever tasted. . . with hot milk to cut the thickness of the coffee. Breakfasts and dinners were included in the tour price. Lunch was on our own, which we normally ate at pool-side (if you could get us out of the souks, that is). Shopping at the local carpet store was another experience. You’re seated on long benches and served mint tea while the proprietor unrolls everything from Berber to Persian carpets. I was only a hair’s breadth from buying a 5′ Berber rug, but how was I going to shlep that along with the caftans? I was sorry I had to leave it in Tangier, since I had bargained the owner down to $250 for a handmade rug. I don’t even know why I bargained . . . I knew I couldn’t shlep it! After two wonderful days in Tangier, it was off to the train station for our short ride to Casablanca ( and more souks). On the train, we had compartments which reminded me of the “Orient Express”, & I expected to see murder mystery writer Agatha Christie walk by at any time. We arrived in Casablanca early enough to check into the hotel and visit more souks (no, I didn’t buy a lot this time). Came back to the hotel and changed for dinner. Dinner was in a dining room on the top floor of the hotel . . . and here we are talking elegance. Decked out like the inside of a tent with thousands of yards of material making up the ceiling. After diner, Rocky arranged for a show at a club across the street from the hotel. I think jet-lag finally hit me. I never made it to the show. Instead, I opted for a hot shower and early to bed. Shara went along with the crowd. I wanted to be well rested for our train ride to Marrakech the following morning since I had to shlep those 14 caftans again. . . oh my achin’ back! This time we had huge leather seats much like barber chairs which reclined. Shara spent a lot of time taking pictures of the scenery through the windows, and oh, what marvelous scenery. . . little villages sprouting up here and there, the Atlas mountains in the background, huge plants of aloe and cactus, and of course, the natives in their 100% Moroccan dress that we would give our eye-teeth for. I myself, fell in love with anything Berber. So much so, that since there aren’t any fast food places in Morocco, one of the gals on the trip suggested that I open my own “Berber King” the next time I go back. Finally we’re in marvelous, magnificent Marrakech! Since we’re in Africa the temperature ranges from the 80’s to the 90’s in June, with clear blue skies. The evenings are a comfortable 60, hence no air conditioning required in the hotels. We checked into the Marrakech Hotel, which reminded me of my own personal garden of Eden. (Rocky does it again). . . Where’s the souks?! Our tour bus picked us up promptly at 2:00 and it was off to see the sites, and oh, what sites they are! The bus stopped along the way for Shara and the other photo buffs to to take some more of the many pictures that they did on this trip. At this stop, we were greeted by “water bearers”; men dressed in red-striped outfits, with brass cups hanging on their chests and a camel skin over their backs filled with water (no, we didn’t drink.) They also wore the craziest looking red hats, much like a Mexican sombrero. . . I had to have one! I found one in the local souk which became my trade-mark for the balance of the trip. Mine is orange and now hangs in my bedroom on my lilac wall. We reloaded the bus, and our next stop was Djemma El F’na, the village square, filled with snake charmers, (yes I put a snake around my neck), acrobats, more water-bearers, fruit stands, jugglers, vendors and the sounds and smells of Marrakech. . . a sight you have to experience to believe. Back on the bus, and off to the Bahia palace. Our guide, who looked like Omar Sharif (no kidding) took us through the courtyard to the tombs, and gave us a thorough explanation of everything we laid our eyes on. We were followed around the Palace by a couple of scrawny cats, who experienced their first taste of Fritos, compliments of Linda Garland (Shamire), one of the gals on the tour. I don’t think their palate will ever be the same. After the Bahia palace, it was back to the hotel, shower, change into fresh clothes. . . and . . . Off to the souks!! 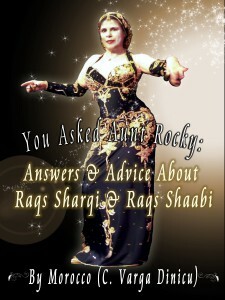 Rocky arranged for us to plunge into the most luscious fabric shops a Middle Eastern dancer could hope for. The shops are in the open air, with rolls upon rolls of metallic chiffons, solids, metallic brocades, etc. Remember when you were a kid and waited for autumn so you could jump into a pile of leaves? That’s what I did in the fabric shops. There is so much to choose from it’s mind-boggling. ‘Course I don’t learn. . . how am I going to shlep 160 yards of fabric for the Troupe on the plane, along with the 14 caftans I bought in Tangier? Will Shara carry some back with her? She did, God love her. Remember me telling you that I went nuts over Berber? In the souk I found Berber shoes, belts, scarves, etc. Now in Marrakech on my third day there I have all of the above along with 160 yards of fabric and 14 caftans. Help! Wait that’s not all of it. I have also accumulated 15 clay pots of henna (for the troupe), 4 pant outfits, a jumpsuit, a couple more caftans (for me), 2 long skirts, a leather jacket, 8 wallets, 3 dolls, a leather camel, 9 velvet purses, chunks of raw musk and raw amber, minnt tea, saffron, 3 antique Berber necklaces, 12 Schikhatt scarves, a set of Moroccan finger cymbals (which are also a great item for making meatballs), 3 rings, my Berber sombrero and a partridge in a pear tree! When I hit customs in New York, they looked at me, laughed, and sent me through. Since persistance pays off. . . I got it all home, however I do have my right arm in a sling! I have now become such a seasoned traveler, I can tell you anything you want to know about how to pack and how to shlep. Though I did bring an extra empty suitcase with me on the trip, I did have to buy another one in Marrakech. I bought a lovely goatskin bag trimmed with Berber rug, with two side pockets, which in themselves would make good size purses. Practically every day, since we didn’t want to keep large sums of money on us or in our rooms, we stopped at the bank on our way to the souk (convenient)! The bank is located within a complex of government price – controlled shops. Since the shops in this complex are Government controlled, as I mentioned, there is no bargaining here. Even with fixed prices, the items we purchased were way, way below what we value them at in the U.S.This was the souk where I bought my leather and Berber rug bag, and had my Berber cross made. Many of the gals on the trip bought in this complex since it was nice and quiet as compared to the hub-bub of the other souk. Everything we did on our trip: banks, hotels, shows, sights, were within walking distance from our hotels which shows that Rocky really does her homework when it comes to planning one of these jaunts. If you don’t like to walk, cabs are plentiful or you can take a horse and carriage. . . and you must bargain with the carriage drivers. One asked 300 Dirhams to bring us back to the hotel, but we bargained him down to 20 Dirhams. In Marrakech, Shara and I were fortunate in engaging the services of one of the many “guides” that follow you through the streets and souks. Ours was Abdullah (who else? ), who became our body guard, carried our bundles, and helped us shop. The day before we left, I wanted to give Abdullah a souvenir and in very broken English/Arabic asked him what he wanted. He pointed to my feet. On my feet were my grubby gym shoes (best thing to walk aroung in). I said. . . “My shoes?” He nodded “yes”. So, in the middle of Rameses V Blvd., I took off my tennis shoes, gave them to Abdullah and walked back to the hotel barefoot. I’m sure he got a very good price for them in the souk. Abdullah in turn, gave Shara a sterling silver hand of Fatima as a souvenir. For my tennis shoes, he gave me his picture. . . well, at least it wasn’t something heavy to carry. The highlight of my journey to the Sahara was watching the National Folk Arts Festival of Marrakech, an annual event that takes place in June, within the ancient walls of the El Badi Palace ruins. The Festival, representing Morocco’s African, Arab and Berber heritage, lasts two weeks. It features approximately 600 entertainers, musicians, dancers, singers, acrobats, and horsemen who come from the Mediterranean coast, the Atlantic plains and the Sahara. The theme of the festival varies from year to year, but what remains distinctive is its authenticity and its profoundly popular character, derived from the original traditions of a brilliant past. In all their finery, 22 tribes partake and perform in this Festival. Here is a brief overview of this breathtaking event as I saw it. Dekka — This rhythmic entertainment is not done by professionals. Marrakesh craftsmen and traders make up the strange orchestra, composed only of tambourines of various sizes made of earthenware, very large clackers or karaksh & long, brass claxons. The ceremony starts with simple and rather solemn rhythms, then the beating speeds up. High and low sounds are cleverly combined and the singers form a powerful choir. The rhythm changes several times but the group keeps together amazingly well. It is an outburst of joy, disciplined ecstasy, a sonorous rapture, without pause. Taounat — Locality situated in the pre-Rif and represented by a dance elaborated which is similar to Ahidous of the Middle Atlas with a more elevated rhythm. Ahouach — Young girls and women dance the “Ahouach” shoulder to shoulder in Ouarzazate, Imin Tanout and the Kelaa of M’Gouna. The men each beat on a bendir (a wooden hoop with a goat skin stretched over it) and sing while female voices respond. Wearing festive robes brilliant with spangled and silver jewels, the women step forwards and backwards and undulate gracefully, with outstretched arms, and keep time by beating the ground with their feet. Large numbers of performers can take part in the “Ahouach” and it can last all night. In the light of big bonfires, the dancers cast flickering shadows on the high walls of the casbahs. Zagora (Akilal Sif) — 162 km southeast of Ourzazate lies the town of Zagora, near the remains of an old fortress built by the Almoravides (XI th century). The dance is the perfect symbol of life in the pre Saharian areas. The nomadism left for the sedentary life is still symbolized with a certain nostalgia in this dance. The rhythm, the atmosphere, are a good reminder of the long marches of the caravans through the desert. Gnaoua — Of African origin, the Gnaoua dance belongs to the brotherhood type of music. The tumblers of Djemaa El F’na in Marrakesh have changed it into a secular entertainment. Instruments have kept their primitive aspect; large drums and sizable forged iron castanets (karaksh) constitute the entire equipment of the orchestra. Cowries and glass beads are used as vestment ornaments and constitute a reminder of both the origin of the show and its magic-religious aspect. It is a show of great dramatic intensity. Ouled Sidi Ahmad ou Moussa — These acrobats belong to the wandering confraternity of Sidi Ahmad ou Moussa, the Tazeroualt saint from south of the Anti-Atlas. Originally the young men did the exercises before joining the group’s archers and guards on reaching maturity. The costumes are always colorful, often embroidered, and they have remained unchanged for centuries. Les Freres Boujemaa — This is more of a traditional attraction than a folklore spectacle. 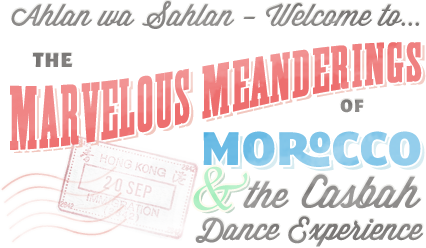 We now have before us performers who have worked out and perfected a sensational show. They use rifles without lock plates. With the handling of their weapons, they produce effects which are worthy of the most skillful jugglers. They are probably the continuation of those famous marksmen who used to be grouped in brotherhoods and enjoyed the highest consideration among the Moroccan people (R’ma). Ahouache of Imin Tanout — The songs and dances of the Chichaoua and Imin Tanout regions are as famous as its carpets. The likeness between the gaudy carpets and the costumes and jewelry of this troupe is quite striking. The notion of color seems to have found its expression in the Imin Tanout. 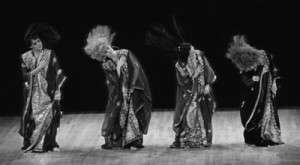 The actual dance is of the same type as that of the Ahouache dance of the high Atlas regions. Guedra — It would take too long to try and explain the significance of this ritual dance to the people of the Moroccan South, where the attitudes and movements come from very ancient symbolism. It is certain that we are attending some sort of cultural ceremony, the origin of which is lost in the darkness of time. The lady dancer appears kneeling and totally covered with her black veil. The rhythm, like a throbbing of the heart, lets the hands, with the lively and expressive fingers, emerge from such darkness. The fingers of the dancer always speak their hermetic language. The head gets free, the face with the eyes closed, performs balance movements. So high is the intensity that at the end, the dancer swoons. Houara — Composed of a number of men and one woman, these dancers come from the Middle Atlas: Inezgane near Agadir. The men start the dance to a quick rhythm, with one or two virtuosos coming out to solo. When the rhythm reaches its peak, the woman rushes into the center. It is a frenzied whirlwind, a dance of rare power, and uncommon physical strength to keep it up and do such complicated steps. 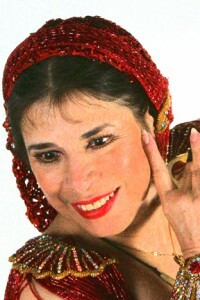 It is without a doubt one of the most spectacular of Moroccan folklore dances and arouses the admiration of all. Oujda — The folklore of this town is also very much influeced by the history of this oriental city. Situated in a strategic position, it has been the theatre of many battles. This explains the character of the dance, which is war-like. Today, to express peace instead of war, they are dressed in white. Tissint — South of Agadir, the men and women, dressed entirely in indigo blue, perform their dances as if they were sacred rites. The dagger dance is clearly symbolic. It is part of the wedding ceremony danced by men and women, to an accelerating rhythm. A young girl and a boy step out of the group and do a duet. The boy, holding a dagger on a cord in his outstretched hand, turns in circles around the girl, coming closer and then retreating. In the end, they are face-to-face, and raising his arms, he hangs the dagger around the girl’s neck as she dances. Slowly the boy goes down on his knees in front of the girl. The song is repeated. Ait Bouguemaz — The leader of the troupe has a special dress, with a pointed bonnet covered by a strip of white muslin. He plays a double flute and is the only professional in the troupe. He produces a nasal whine with his instrument that has a striking effect. At times the dance is light, with slides and short steps, then heavier with stomping of the feet on the ground. This is a dance for mountain folk, rather abstract but in which one may discern a certain virility, typical of war dances. Lakbab – It’s a dance named Ahidous. The artists dance with a traditional purity that is enchanting to the eyes. The dancers form a large circle and swing to the rhythm of the tambourines. They outline simple figures, go backwards and forwards and the movements remain discreet, marked by modesty and dignity. Haha — The only music is a solo flute made of a reed with seven holes of an elementary design. A powerful drumming effect is produced by hand clapping and stamping on the ground. The men dance powerfully and the rhythm is so spell-binding that one does not tire of watching the precision of the gestures and grandeur of the ensemble. Ghiata — Warriors, holding rifles, dance to the tune of drums and musettes. The dancers simulate cavalcades, point at an imaginary enemy, exhibit their weapons for admiration, play with them as if with toys, put them on their heads, swing them at the tip of their arms. In a circle, the warriors turn to the rhythm of the noisy orchestra. They bring the guns to their shoulders, aim the barrels towards the ground and, on a brief order from their leader, fire their powder charge. Ait Hadidou — The women wear handiras (blue capes with white stripes). Married ones and widows can use akilous, a kind of henna. Large necklaces of yellow amber beads and heavy silver jewelry make wildly beautiful ornaments. The men wear long burnous robes with impressive turbans worn around their heads. Their “Ahidous” dance is always fascinating although static. Here, we watch gestures that have resisted the passing of time, but whose meanings are now lost forever. Figuig — Originally from the locality of Hobi-Hobi, this troupe offers an original engagement dance. Every year, in the summer, young boys and girls reaching marriage age organize feasts where choices are made. The young people form a circle and start singing songs whose content is a throaty call, praising the beauty of the girls. The girls in the middle of the circle dance gracefully and look stealthily under their khol-marked eyes. Taskiouine — This is doubtless a warrior’s dance, where women have no part. The dancers, dressed in white tunics, wearing turbans on their heads and powder kegs on their shoulders, beat out the rhythm with the sound of a skin covered red terracotta drum. Trilling is followed by sudden halts, punctuated by floor beatings of their feet, performed in perfect harmony. It’s a frank. powerful, manly dance, without sophisticated movements or ambiguity. Rwaiss — The musical instruments are composed of a Rbab Soussi (a single stringed violin) and a number of Gimbris (banjos with three strings.) The rhythm is given by a metal piece placed on the ground on which a young man plays. Young ladies accompany the troupe with finger cymbals made of copper. They wear colored caftans and embroidered d’finas. The spectacle presented by each of these tribes must be seen. One does not go to Morocco with the intent of gazing upon a chiffon-skirted, jewel-bedecked “belly” (how I hate that word) dancer, although the shows that we saw in the various clubs did have an Oriental Dancer. One goes to Morocco to take in “folkloric” which can only be described in one word. . . authentic. So marvelous is the authentic dancing, costuming and music that it leaves one speechless while partaking in a part of timeless history. I’m returning to Morocco with Morocco (international tour guide, teacher and performer) in 1985. I didn’t get enough of it the first time around. I’m also positive that there were some Souks I must have missed last year that I’m going to find this year!